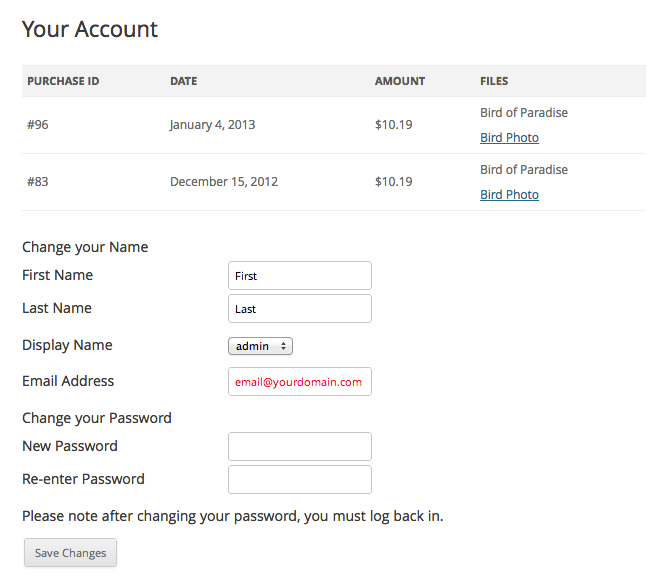 You can easily create an account page for your customers with just two simple short codes. Create a new page and give it a title. For example, "Your Account"
Place the [purchase_history] shortcode inside the account page to show a list of the customer's previous orders. On the next line, use the [edd_profile_editor] shortcode to give your customers the option to edit their account information, such as, name, email and password. Once your page is published, customers will be able to view their purchase history and edit their profile. If a logged-out user accesses the page, they will be presented with a login form.